Griffin Loves to paint. And color. And stamp stamp stamp! Thank goodness, because otherwise, I’m not quite sure what we would do on these 100+ degree days where we can’t possibly step outside without fear of burning our tooshies off! So, we sit down at the table (generally clothed at first) and get to work first with marker and crayons, then stamps, and eventually paint. He absolutely adores to paint. This time we painted our hands (and feet!) and stamped them onto papers and then, when all was said and done we created a gallery in our stairwell that has so much room to grow. He Loves to stand in front of it and say “cheese” and it’s utterly adorable and I can’t wait to make more (which I’m sure we will!). 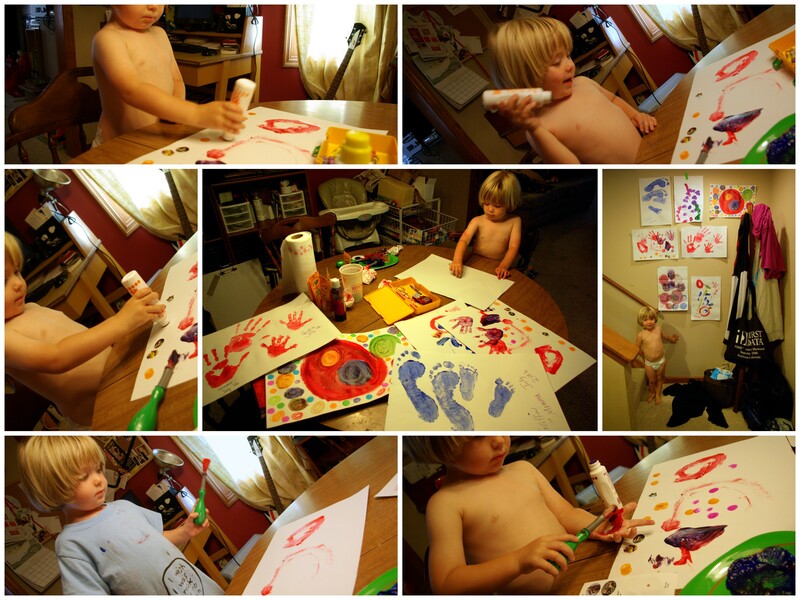 Do you create art with your child? What do you use? I’m running out of ideas for pen to paper – stamps, markers, crayons, paint . . . what else is there? Do you make play dough? Slime? I think that’s next on our list!